Many books have been written about motorcycle travel, some epic tales of vast distances covered, others simple recitations of where the writers have been. Some are great reads in which you, the reader, are actually there; others no more interesting than reading a road map aloud. pretty much define the genre. 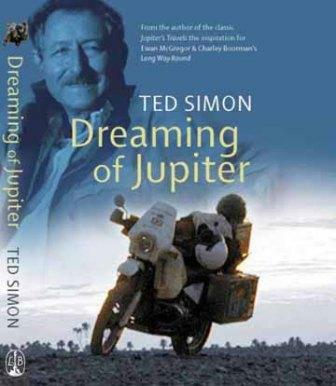 His first book, Jupiter’s Travels, was written in 1977 after he rode a 500cc Triumph Tiger around the world in four years. Round-the-world rides had been done before — Robert Fulton’s One Man Caravan comes immediately to mind — but Simon’s book helped inspire many others to do their own adventures. Simon was an established writer in his early 40s who learned how to ride a motorcycle, a distinction from motorcyclists who try to write. The writers usually turn out better-told stories, even if the motorcyclists take more exciting rides. Simon repeated his epic ride in 2001, when he was 70 years old. He wanted to know how the world had changed and if he could do it again. Those travels are chronicled in Dreaming of Jupiter. There are other good books, of course. Ted Bishop’s Riding with Rilke does a great job of conveying the thrill of riding, as does Melissa Holbrook Pierson’s The Perfect Vehicle. Robert Pirsig’s Zen and the Art of Motorcycle Maintenance has a paragraph on the first page that begins: “You see things on a motorcycle in a way that is completely different from any other. …” That paragraph is worth the price of the whole book. Ewan McGregor’s and Charley Boorman’s Long Way Round deserves a mention, not for great literary prowess, but for its motivational effect on other would-be adventurers. (I once heard a guy in an MSF course cite Long Way Round as the reason he got into motorcycling.) The book is good, but the filmed documentary is better. McGregor credits Jupiter’s Travels as his inspiration, and Simon himself appears in the Mongolian segment of the documentary. 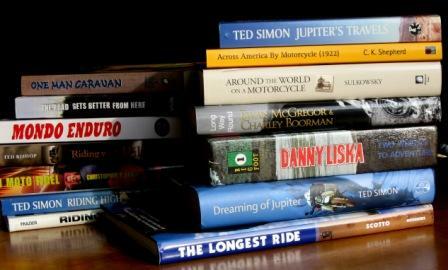 For the motorcycle traveler, books are often in the shadows of travel gear, somewhere behind the bikes themselves, the helmet, riding gear, and maps that are part of the journey. But the books provide the dreams and dreams of future rides are what we live on, especially during cold winter nights when we need the possibilities to be endless.